For those outside Canada, in case you haven’t heard, we’re in the middle of a general election. Canada has a parliamentary system, modelled after the British one, with a first-past-the-post system for electing representatives (members of parliament), where party with the most seats after the election is invited to form a government, and its leader to become Prime Minister. For the last few parliaments we’ve had minority governments, first Liberal, then Conservative. Somewhere along the way, many people just stopped voting: from turnouts in the high 70s back in the 60’s, we’ve had 64.7% and then 58.8% turnout respectively in the last two elections – the last being the lowest turnout ever. There maybe many different reasons for this lack of enthusiasm, although listening to the main parties whining about each other during this election, it’s not hard to see why so many people just don’t bother. But one thing is clear: young people are far less likely to vote than any other age group. Just look at how the projected composition of parliament would look it it were up to the youngsters: the Liberals and the Green Party virtually neck-and-neck for most votes, and instead of the greens being shut out of parliament, they’d hold 43 seats! Of course, the projected seat count also throws into sharp focus what’s wrong with our current voting system: the Bloq, with lowest share of the vote of any of the parties would still hold 60 seats. And the Liberals with just 2% more of the votes than the greens would still get more than twice as many seats. Nevertheless, I like this picture much more than the parliaments we’ve had in the last few elections. So, if you’re eligible to vote, and you’re anywhere around half my age, make my day – help change our parliament for the better! Voting is also far less convenient for young people, at least the first time around. This is the first federal election I am old enough to vote in, so I had to bus down to the Elections Canada office and register for the voter’s list. If someone didn’t realize they weren’t on the list in time, they would be out of luck on election day. Thanks for those pie charts, they were very enlightening. I am coming to realize just how archaic first-past-the-post is. [Kate] Thanks for those pie charts, they were very enlightening. 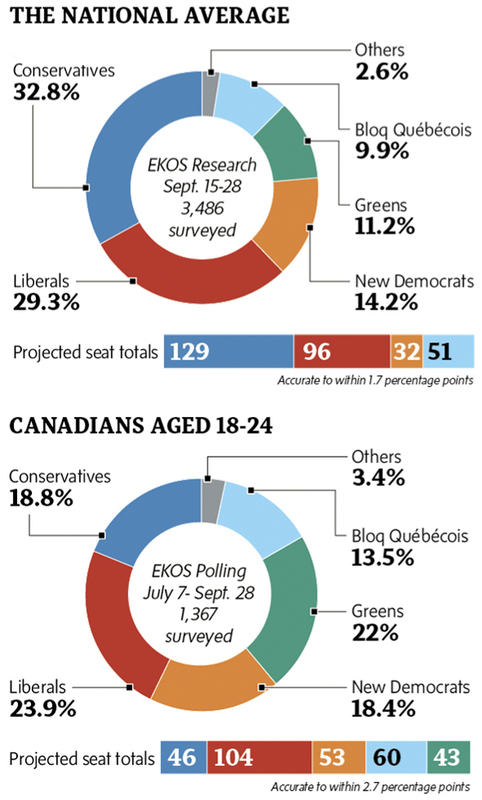 They’re certainly heartening, but I’d prefer some enlightenment regarding the source (since, as usual, methodology matters) and Canadian electoral dynamics. Are the national and youth samples from eligible or likely voters? (I assume the latter, but ICBW.) Does propensity to vote increase with age (as in the US)? If so, this might not be so great. I seem to recall (again, ICBW) reading an article about US voter demographics and the “Reagan youth.” In the early 1980s US, the youth (i.e., those born from the late 1950s to early 1960s) electoral profile (e.g., party propensity of those actually voting) was unprecedentedly right-wing. US Republicans heralded as the road to longterm electoral success: the assumption was, as they aged, more would vote, with the same electoral profile. The article showed this to be false through the mid-2000s: the electoral profile of voters from the same cohort (late 1950s–early 1960s) was much more evenly divided than it had been 20-some years before. The rest of the article hypothesized: e.g., was this due to changing individual preference change, or immigration, or what? IIRC the position of the authors was that individual preferences had not changed–it seems most folks don’t “age out” of youthful political preferences–but that the segment of the cohort who had not voted in their youth but who began to vote later were significantly more centrist than the youth voters. If that hypothesis concerning US electoral dynamics is true, and if it holds for Canada as well, then increasing overall youth participation in the context above might not improve outcomes (i.e., for those of us on the left); it would just bring out less motivated, more centrist youth. The real solution is, as unfortunately the Republicans have realized and mostly solved, base mobilization: getting out your voters and (where the Republicans excel) suppressing your opponents’. [Kate] how archaic first-past-the-post is. At least when combined with district aggregation. What most shocked me was, IIUC the first chart, the Greens outpoll the Bloc, but get no seats. So a national minority party can achieve representation only by being a regional majority: what a great way to encourage regional factionalization. Perhaps this will change if the “mother country” adopts AV?